One of the most important lessons learned from the Great Recession is that housing is an investment in individuals, relationships, and families, not just a financial investment, says Emory Law Professor Frank S. Alexander. 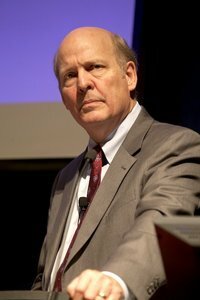 “Building housing is one of the most significant drivers of gross domestic product, but building housing for people is what allows them to build lives for the future,” Alexander said during the Currie Lecture in Law and Religion, hosted by Emory’s Center for the Study of Law and Religion Feb. 20. Alexander’s lecture, “Housing America’s Families: Investments, Risks and Families,” explored some of the causes of the recent mortgage crisis and outlined an approach for how Americans should view housing going forward. One of the nation’s leading authorities on the mortgage crisis, Alexander is Sam Nunn Professor of Law and CSLR’s founding director. In addition to complicated mortgage packages, the home equity line of credit (HELOC) played a significant role in the crisis. “We came to view our homes as sources of easy cash. With prices rising at 10 to 20 percent every year, we could constantly refinance and have more money,” he said. These and other factors led to unprecedented increases in (1) residential mortgage debt, from less than $1 trillion in 1980 to $10 trillion in 2010, and (2) mortgage foreclosures, growing from about 500,000 annually prior to the year 2000 to 4 million in 2011. “Homeownership has been remarkably relatively stable for the past 50 years, ranging from 60 to 68 percent, and I see absolutely no justification for a cultural shift back to homeownership rates that we haven’t seen since the days Dwight Eisenhower first became president,” he said. Further evidence that homeownership should be available to all Americans, he said, is that recent studies have reconfirmed what we’ve known for decades: children who reside in some form of homeownership do better in life than children who don’t. Among the statistics: they are 25 percent more likely to graduate from high school, over 100 percent more likely to go to college, and nearly 60 percent more likely to own their own home. What’s more, during the Great Recession, low income, traditionally high-risk homeowners who had good community support defaulted less on their mortgages than other homeowners. In 2010, while default rates on prime mortgages quadrupled, defaults on loans made to Habitat for Humanity homeowners barely increased -- from their historical rate of below 1 percent up to 2 percent during the worst of the mortgage crisis. “Why? Because Habitat is a community that is committed to the people, the families, the children in the homes,” Alexander said. One of the reasons homeownership as a viable option for all Americans is now being questioned, Alexander explained, is that “over the past generation, our understanding of the nature and function of housing has profoundly shifted. “We knew it was an investment, but we have come to view it as a speculative financial investment; sometimes you win, and sometimes you lose. We put our housing, our shelter, our homes on a roulette wheel and we lost. 3. It’s all about the children. During the Great Recession, 2.3 million children lost owner-occupied homes to foreclosure. Currently, 3 million are at risk to lose their owned homes. The Currie Lecture in Law and Religion was founded in 1986 with a generous grant from Overton and Lavona Currie.